TVI has a 30.66% equity interest in TVI Resource Development (Phils) Inc. (“TVIRD”), a private Philippine resource company with operations, development and exploration projects in the Philippines. TVIRD eventually aims to go public by listing on the Philippine Stock Exchange once Philippine market conditions stabilize and government policies towards the mining industry are clearly defined. The Agata nickel laterite DSO project is managed by joint venture company Agata Mining Ventures Inc. (AMVI), in which TVIRD holds a 60% interest and is the operator. The remaining shares are held by Minimax Mineral Exploration Corporation and MRL Nickel Philippines Inc. The project is located in a 4,995-hectare Mineral Processing Sharing Agreement (MPSA) area located in the adjacent municipalities of Tubay, Jabonga and Santiago in Agusan del Norte province, within the Surigao mining region on the island of Mindanao, the Philippines. The Surigao region is a major lateritic nickel producing region providing ore to processing plants in Australia, China, Korea and Japan. The project mine site is located just 3.5 km from its own deeply protected seaport which provides the opportunity for year-round shipping. An April 2013 NI 43-101 compliant technical report shows the project to have nickel laterite resources of 33.9 million tonnes grading 1.1% nickel and 22.5% iron in the Measure and Indicated categories and an additional 2.1 million tonnes grading 1.0% nickel and 16.3% iron in the Inferred resource category. The above resource formed the basis of a Mineral Reserve estimate for a Feasibility Study completed on the DSO operation in August 2013 which shows Proven and Probable Reserves of 9.7 million wet metric tonnes with a grade of 48% Fe with 0.9% Ni. AMVI has engaged the services of a third party Qualified Person to review the remaining resource and reserves of the project. The review may result in an increase or decrease of the remaining mineable reserves and mine life of the project. The review is expected to be completed through the second half of 2018 and will include additional resources found beyond the previous pit limits. Nickel laterite direct shipping ore operations began in October 2014 consisting of weekly shipments of approximately 55,000 wet metric tonnes (wmt) of high-iron/low nickel limonite ore as well as higher nickel content saprolite ore. Over 400 people are employed at the mine and a total of 10.7 million wet metric tonnes have been shipped through 187 shipments as at the end of September 2018. AMVI’s Agata operation was the first Philippine mining operation to be awarded the Titanium Award at the Presidential Mineral Industry and Environmental Awards Ceremony in November 2015 after just one year in operation. The Titanium Award recognized AMVI for exceptional implementation of its approved Environment Protection and Enhancement Program, Social Development and Management Program and its ongoing Occupational Health and Safety Program. The operation was again awarded the same Titanium Award at the 2016 Presidential Mineral Industry and Environmental Awards Ceremony, the Platinum Award at the 2017 ceremony and, most notably, has received in 2018 the highest award given by the Presidential Mineral Industry and Environmental Awards Selection Committee – the Presidential Industry Award. From October 2014 to April 2015, TVIRD has completed a 16,768-metre, 986-hole drill program to validate and increase the existing resources previously disclosed in April 2013. A Philippine Mineral Reporting Code report was completed on the project which will support the project's valuation when TVIRD seeks to list on the Philippine Stock Exchange in the future. For more information, please visit TVIRD’s website at www.tvird.com.ph. The Agata project is held by Agata Mining Ventures Inc. (AMVI), a joint venture company in which TVIRD holds a 60% interest and is the operator. The project is located in a 4,995-hectare Mineral Processing Sharing Agreement (MPSA) area located in the adjacent municipalities of Tubay, Jabonga and Santiago in Agusan del Norte province. It is accessible by land (approximately 1.5-hours driving time) from the provincial capital of Butuan. The project is situated to the south of TVIRD's current Agata nickel laterite direct shipping ore ("DSO") operation and immediately adjacent to the causeway facilities that were built to support the DSO operations. From November 2014 to April 2015, AMVI completed a 17-hole drill program aimed establishing an initial resource estimate at the project. Drill results had confirmed the presence of a high-purity recrystallized limestone deposit covering an area of 600 metres by 650 metres. Significant intercepts yielded between 80% to 100% CaCO3. These results have been used as the basis for a technical report compiled to Philippine Mineral Reporting Code standards which was completed in August 2015. AMVI is continuing to evaluate the feasibility of commencing a limestone direct shipping ore operation or producing hydrated lime and a higher value ground calcium carbonate (“GCC”) product marketable to the paper and plastics industries in Asia. Due to the project's close proximity to the causeway where materials will be shipped, potential operations will benefit from having low transport and handling costs. AMVI has been in discussion with limestone companies for the production of different products. In May 2016, a Japanese mining company commenced a due diligence review of the Payong payong limestone and confirmed the quality and quantity of the resource for possible supply to the steel and construction industry. Further evaluation of the three other potential limestone sites is currently underway. An exploration permit (EP 27) covering both San Vicente and San Jose has been renewed thereby allowing drilling in San Vicente to proceed. Drilling in San Vicente was completed in June with 10 holes with a meterage of 1,109 meters. Assaying and resource evaluation is in progress and is expected to be completed by Q4 2018. TVIRD owns 100% of the Balabag project. The project covers a 4,779-hectare Mineral Processing Sharing Agreement (MPSA) located in the town of Bayog, Zamboanga del Sur province, the Philippines. The project is situated approximately 75 kilometers (47 miles) east-northeast of TVIRD’s Canatuan mine. Based on results of drilling completed to the end of June 2011 and as included in the Balabag NI 43-101 technical report dated June 23, 2012, the current indicated mineral resource is estimated to be 1.78 million tonnes averaging 2.34 g/t gold and 72.3 g/t silver, containing 134,262 ounces of gold and 4,148,196 ounces of silver. Please click here to see the NI43-101 technical report dated June 23, 2012 entitled "NI 43-101 Technical Report on the Balabag Gold Project, Zamboanga Province, Philippines”. To date, a total of 296 holes have been drilled for a total of 34,156 meters at the Balabag project. During the first half of 2013, TVIRD completed 18 additional infill or extension drill holes equivalent to 1,221 metres. In addition, mapping and sampling activities were carried out in the underground workings, and trenching and soil grid geochemical surveys were done over the eastern and southern part of Balabag hill. The discovery of multi-directional veining has increased the potential of finding more veins. While exploration and development work was placed on hold at the Balabag project since mid-2013 pending the receipt of all permits to develop the project, TVIRD has proceeded with a two-phase exploration program for the Balabag gold/silver project. The first phase includes the re-mapping of tunnels that were abandoned by the illegal small-scale miners and were previously inaccessible to TVIRD. With the new information coming from these tunnels, it is expected that an improved interpretation of the vein systems of Lalab and Miswi veins will be established. At the same time too, TVIRD has continued to work on the engineering design for a gold-silver processing plant to process ore on-site and has also constructed and maintained 16 kilometres of access roads to the project in anticipation of the commencement of construction. A pilot plant was established in 2013 to carry out metallurgical test work with initial results showing overall recoveries of 93% for gold and 90% for silver after 36 hours of leach time. Since mid-2013, exploration and development work has been on hold pending the receipt of all permits. From that period through to the current date, TVIRD has continued to work on the engineering design for a gold-silver processing plant to process ore on site. TVIRD has also constructed and maintained 16 kilometers of access roads to the project in anticipation of the commencement of construction. TVIRD received in October 2013 the Environmental Compliance Certificate (“ECC”) and in April 2016 the Declaration of Mining Project Feasibility (“DMPF”) for the Balabag project. Further to learning in February 2017 that Mineral Production Sharing Agreement (“MPSA”) No.086-97-IX, in which the Balabag project is located, is among 75 MPSAs that have been recommended for cancellation, TVIRD continues to await a formal response to its letter to the DENR of February 2017 in which it has emphasized its position that there exists no grounds to validly cancel, terminate or suspend the MPSA between the government and TVIRD as there is neither violation of the terms of the MPSA nor of any law, rule or regulation that would merit its cancellation, termination or suspension. Of note also is that the Balabag project requires resolution of the open-pit mining ban announced by the former DENR Secretary in February 2017. TVIRD’s position is that mining at Balabag will not use an open pit approach but rather a side cut approach, similar to what was done at Canatuan, which TVIRD understands to be acceptable to the Philippine Government. TVIRD has received in May 2018 the Special Tree-Cutting and Earth Balling Permit from the Forest Management Bureau (“FMB”) of the DENR, for which it is coordinating with the FMB the mechanics related to implementation. This is the last of the major permits required before development can commence at Balabag, subject to resolution of DENR issues noted above. Canatuan is owned 100% by TVIRD. The project is a volcanogenic massive sulphide (VMS) deposit located in the Province of Zamboanga del Norte on the island of Mindanao in the Philippines. From 2004 to mid-2008 TVIRD produced gold and silver doré from an overlying gossan (oxidized) portion of the deposit. As this upper portion of the orebody was mined out, the underlying primary sulphide portion of the deposit containing copper and zinc was exposed. By November 2008, TVIRD had completed construction of a sulphide production plant to process the underlying sulphide orebody containing copper and zinc and commenced commercial production of copper concentrate in March 2009. From March 2009 to February 2014, TVIRD completed 39 shipments of copper concentrate for a total volume of 199,778 dmt and 7 shipments of zinc concentrate for a total volume of 30,548 dmt. Milling operations concluded in January 2014. The Canatuan processing plant has been decommissioned and equipment reconditioned for use in the Balabag Project. 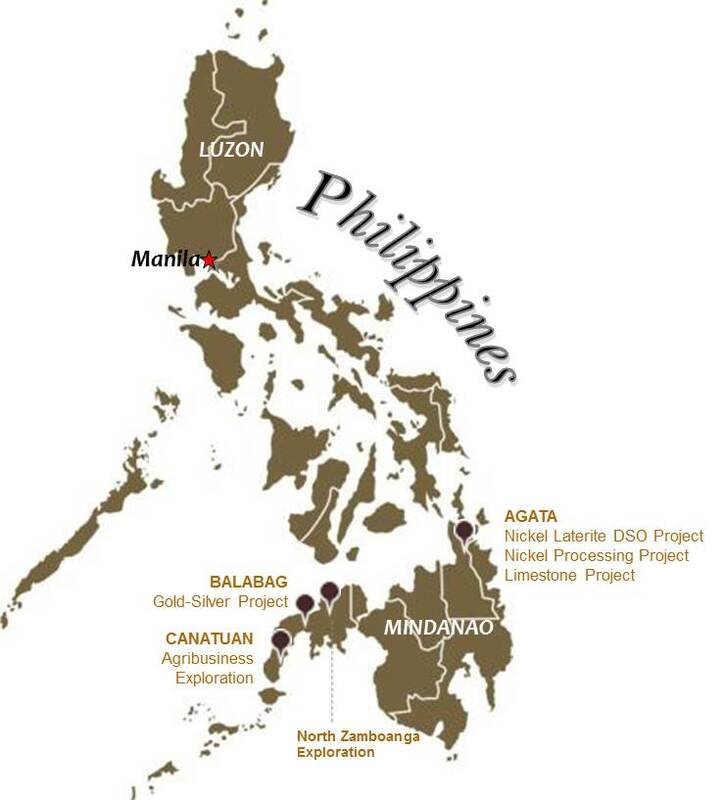 Among the prospects TVIRD is exploring are possible new discoveries from exploration drill targets outside of the pit area, possible production of pyrite concentrates, re-processing of tails and harnessing possible economic deposits from outside the current MPSA – Malusok and SE Malusok – which are located at a short trucking distance from the Canatuan mine pit. TVIRD’s application for expansion of its current MPSA to include these deposits in areas adjacent to its current contract area had been approved by the MGB. Following the end of mining and processing operations in January 2014, decommissioning and rehabilitation activities within the disturbed areas commenced. Approximately 183 hectares are subject to the closure programs as identified in the approved Final Mine Rehabilitation and Decommissioning Plan (FMRDP). Year 2014 was considered a Transition Period prior to implementation of the final mine closure plan. Activities during this period were limited to equipment decommissioning, care and maintenance of the areas that had undergone prior progressive rehabilitation and preparation of the area for implementation of the FMRDP. An Active Closure Phase followed in Year 2015 and continued through mid-2018. The program was designed to focus on structural improvements for drainage, erosion control and slope stability as well as soil conditioning and preparation and planting of cash crops and diverse forest species. To date, 168 hectares, representing 92% of the total disturbed area, is rehabilitated. TVIRD has also planted close to 600,000 trees, including contributions to the National Greening Program. A Passive Closure Phase was scheduled for the remaining half of 2018 and is expected to continue through 2020. The activities are designed to focus on care and maintenance of the rehabilitation programs completed during progressive rehabilitation during the operations phase and those activities completed during the Active Closure Phase. Both Third Party and internal environmental monitoring programs were planned to continue throughout the mine closure period. The internal monitoring program involves regular data collection for meteorology, water quality, stream hydrology and instrumentation data collection for the Tailings Storage Facility. Third Party monitoring programs completed during the Active Closure Phase include flora and fauna monitoring, air quality monitoring, and aquatic habitat monitoring. TVI has an extensive 352 square kilometer (136 square mile) package of tenement applications surrounding the Canatuan mine that make up the Greater Canatuan Tenement Area (GCTA). Volcanogenic sulphide deposits, like Canatuan, rarely occur in isolation. TVIRD believes that similar Canatuan-style deposits exist within the GCTA and that there is a potential for discovering extension developments. MPSA processing and approval are on hold due to the ongoing moratorium on new mineral permit applications imposed by the Secretary of the Department of the Environment and Natural Resources (DENR) in compliance with Executive Order No. 79, Series of 2012. In March 2013, the DENR lifted the moratorium on application for exploration permits but retained the moratorium on MPSAs and financial or technical assistance agreements despite the signing of the much awaited Executive Order by the President of the Philippines. In November 2014, the DENR’s Mines and Geosciences Bureau (MGB) relaxed the current mining policy, allowing companies faced with depleting reserves to expand their contract areas. In July 2018, the DENR lifted the Moratorium on the acceptance, processing and/or approval of Exploration Permit applications. The order took effect on August 10, 2018. The North Zamboanga tenements consist of 11 permit applications covering 1,240 square kilometres (771 square miles) of the Zamboanga Peninsula on the island of Mindanao in the Philippines. The properties are 100% owned by TVIRD. The current permit applications cover a number of mineral targets identified by a prior exploration program conducted by a major international company, numbering over 20 epithermal gold, massive sulphide and porphyry copper-gold prospects. Reconnaissance work carried out to date has supported historical findings and has resulted in the discovery of additional prospects of interest. Indications of mineralization often occur on the surface and have been easily accessible to our exploration teams. Among the more prominent prospects in the North Zamboanga tenement package is the Bonbon area, which is covered by an 81 square kilometre (50 square mile) Exploration Permit Application. Bonbon is made up of a series of north-northwest trending quartz veinlets/stockworks in highly altered volcanics and intrusives, spread over a 10 kilometre (6 mile) long by 2 kilometre (1 mile) wide area. Geologic mapping and sampling as well as geophysical surveys are in the planning stages in order to locate prospective drill targets. In 2013, TVIRD created a wholly owned subsidiary, TVI Agriproducts Inc., which entered into a 50:50 agribusiness joint venture with agricultural commodity manufacturer and marketer Kennemer Foods International to create and establish of a joint agri-enterprise for cacao production via company-managed plantations in the municipalities of Siocon and Baliguian in Zamboanga Del Norte. Siocon and Baliguian are neighboring municipalities of TVIRD’s Canatuan mine which was decommissioned in late 2013. Under the agreement, both companies will undertake the development of plantations through consolidated landholdings either through lease or revenue sharing agreements together with individual farmers and lot owners and recognized indigenous peoples communities. Each plantation will have a consolidated area of no less than 100 hectares within the ancestral domain of the Subanons – TVIRD’s indigenous hosts - and nearby areas. The agreement also specifies the development of contract growing agreements with the farmers wherein the cacao produced from the plantations will be marketed and exported according to mutually-agreed terms of yield-sharing. As the first local company to operate under the Mining Act of 1995, TVIRD has introduced livelihood programs to the community as part of its corporate social commitments and the joint agri-enterprise represents its most aggressive initiative to date. The initiative is set to provide the immediate community with a sustainable enterprise beyond the life-of-mine. The company also has interests in neighboring Balabag and in Agusan Del Norte. Based on a development roadmap culled from a study conducted by the University of Asia and the Pacific (UA&P), the project would expand to a total of 1,600 hectares over four years, depending on available land, and at a financial internal rate of return of seven years. Additionally, the project could generate close to 1,300 jobs for the local community or an additional 400 jobs if TVIRD workers are absorbed by the joint venture company.